What If You Are Not Getting This Right? First your patient finds you then they speak to you on the phone and make an appointment. They now arrive at your practice for their appointment. This is all the beginning of your patient’s experience. You want to ensure every part of the patient’s experience represents you and your business. One of the biggest missed opportunities is the patient experience when your patient arrives for their appointment. Have a really good think about the moment your patient arrives for their appointment. Great questions to ask yourself. Great questions to ask your team. When your patient arrives at your practice please don’t direct them to your WAITING ROOM. Your patient should be making themselves comfortable in your PATIENT LOUNGE. I know they are just words but they are such powerful words when you get them right. I know the words I would want to hear when I arrive at your dental practice. Your patient lounge not a place to wait so why do we call it a “waiting room”. Start by giving your patient the message that the patient is a place to relax and get ready. Make you patient lounge patient focused. Find out what your patients would like and meet their needs. Your patient lounge can even be what attracts people to your practice, especially if you are fortunate and have a shop frontage. Patients love knowing what to expect visually before they visit you. So what does your patient see when they arrive? Look at your patient lounge. Is it current, comfortable and inviting to your patients? This is a small investment to make to ensure your patients have a fabulous visual experience and they are comfortable and impressed with what they see. Position chairs and/or lounges so patients can talk to other patients and sit quietly if they choose. There is nothing worse than having out of date magazines that patients have read before. Your patients will think you don’t care enough about them and can’t be bothered to spend money on them. 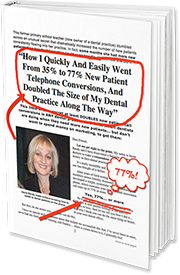 Offer both dental and non dental reading material so your patients have a choice. Also offer a screen with dental videos for your patients. Many of your patients are interested and hungry for information. A practice tour video is a great idea. Patients also love it when you offer them something. It can be a cold drink, a cup of coffee, fruit in a fruit bowl. Patients always love the mini sample toothpastes they can take out of a bowl. This shows your patients that you are generous and thoughtful! Keep your patient lounge clean throughout the day. Have a system for your team to be responsible for keeping the patient lounge clean and tidy. Dirty fingerprints on glass is never a good look. Check the smell in the patient lounge. Try to create a non dental aroma with subtle air fresheners. Why have your lounge smelling like a dental surgery straight away. When your patients arrive, have a great greeting. You have a greeting when you answer the phone so make sure you have one when your patient arrives at your practice. You know who is walking in the door next. You have your appointment book with the time the patient is arriving, so use it and be ready for your patient’s arrival. Remember what your patients see, hear and smell when they arrive at your practice, will influence what they think about you the dentist and even whether they want to continue seeing you.